OLFA Cutter Extra Heavy Duty XH-1 Model 1071858 25mm features an anti-slip cushion handle for exceptional comfort and safety and a chemical resistant handle for easy cleaning. 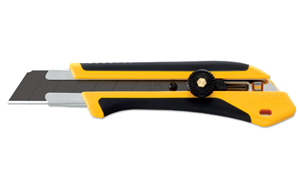 The heavy gauge stainless steel blade channel holds blades tight and there is a ratchet wheel blade lock. Comes with 1 HB blade. Uses replacement blades HB. Suggested uses include cutting leather, rubber, cardboard, roofing, drywall, heavy rope, linoleum, carpet and plywood. OLFA Handles Are Guaranteed Forever.